The Kamchatka Brown Bear , is one of the largest bear species, (the same species inhabits Kodiak Island in Alaska). The average size of a mature Kamchatka bear is approximately 8.5 feet with a 25-inch skull. There are also bears measuring 9.8 feet and larger, these bears are enormous animals, and only 15% of our hunters take trophies of such imposing size. 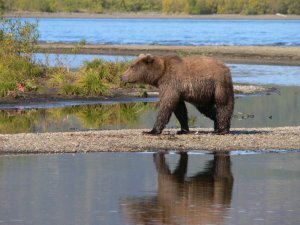 The population of the Kamchatka Brown Bear is between 11 and 12 thousand animals, of which approximately 900 inhabit the reserves. Our scientists affirm that sports hunting does not threaten the bear population in Kamchatka. The annual harvest from bear hunting does not exceed 10% of the population. 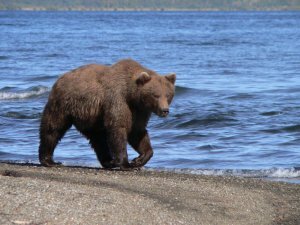 Urgard has been successfully arranging Brown Bear Hunting for 9 years in very productive hunting areas in the central and northern parts of the peninsula. All our hunting camps are well kept. Accommodations in cabins and tents are comfortable, heated, and spacious. Three of our camps are near hot mineral springs where you can relax and soak after a hard day of hunting. In most camps there are saunas for your comfort. Our professional staff takes special care of our clients and will make your stay enjoyable and memorable. You will also have an abundance of Russian home-style food in camp. An interpreter will accompany you during the entire stay, both in the city and in the field. 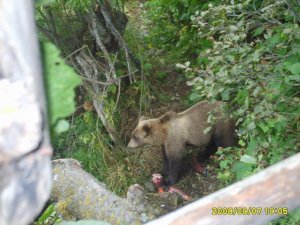 You will have your own experienced guide who has excellent knowledge of wild life in the area and will assist you in harvesting your trophy Kamchatka Brown Bear.